Short days and a chilly breeze off the Pacific Ocean. Time for a winter story—at least, a Northern California winter story. Instead of snow, we have butterflies. Monarch butterflies, to be exact. 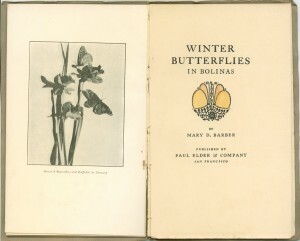 Mary Barber’s short essay Winter Butterflies in Bolinas describes the annual September arrival of thousands of Monarchs to the quiet Bolinas peninsula, on the Pacific coast an hour’s drive north of San Francisco. The migration has always fascinated scientists and public alike: Why do the butterflies migrate at all? What is special about the particular gathering points? What instinct guides them to the same trees every year? When on a yacht bound for the Farallone Islands members of the party saw one of these butterflies soaring over the ocean about ten miles from shore. It did not rest on the boat, but with wings spread before the east wind it sped away, folliwng the path of the setting sun like a soul in quest of the ideal. That evening a storm came on suddenly. 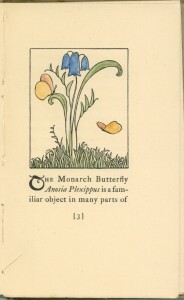 What was the fate of that lone butterfly? 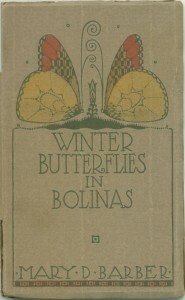 Winter Butterflies in Bolinas was printed at the Tomoye Press in January 1918 by Ricardo J. Orozco. The decorations are by Rudolph F. Schaeffer. I have been unable to find out any information on Mary Barber. Next post: Updated bookstore pages!